Despite declining subscriber numbers, Blizzard says World of Warcraft won't be made free-to-play. Activision revealed earlier this week that World of Warcraft dropped another 100,000 subscribers, which isn't as bad as it sounds in the context of its remaining 7.6 million users and a greatly reduced decline compared to that of the previous quarter. It's still a far cry from the glory days of 12 million users, though, but don't expect Blizzard to hop aboard the popular (and, for many, lucrative) free-to-play train anytime soon. 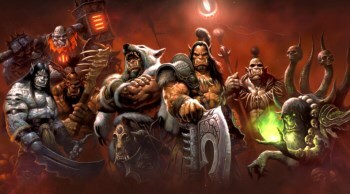 "We didn't make the game to be free-to-play," World of Warcraft Production Director J. Allen Brack told Eurogamer. "We would have to rework the game pretty significantly in order to make it free-to-play. It's not something we're currently considering." Brack said he hoped Warlords of Draenor, the WoW expansion revealed yesterday at Blizzcon, would increase subscriber numbers, but added that the development team focuses on creating content, while "business concerns" are left to the publisher. Despite the declining numbers, World of Warcraft remains the heavyweight champion of subscription MMOs, and the "not currently" qualifier leaves the door open to reconsideration in the future. Which is probably wise: In 2008 Blizzard's Rob Pardo ruled out microtransactions, saying they would be a "betrayal" of the user base, but in July the studio reversed that stance and confirmed that they will be implemented. Five years is an eternity for a videogame, to be fair, but as they old saying goes, never say never.